MEMBERS: Asami, Satoda Mai, Miunai. AGE: Asami - 07/17/1984, Satoda - 03/29/1984, Miunai - 02/12/1987. This is a Hello! Project group. The theme of the group was originally having it consist of "country girls" from Hokkaido. The original lineup for this group was Toda Rinne, Kobayashi Azusa, Yanagihara Hiromi. Shortly after the group's formation, Yanagihara died in a car accident, and Kobayashi left shortely thereafter. Hence, the group's second single was just Rinne. In 2000, Kimura was recruited to the group. 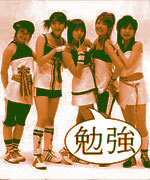 In 2001, Morning Musume's Ishikawa Rika became a temporary member, and the group became "Country Musume ni Ishikawa" (Country Musume and Ishikawa). And in 2002, Satoday joined the group, and Rinne graduated from it. In 2003, Miunai was recruited, and Konno Asami and Fujimoto Miki (both of Morning Musume) stepped in as temporary members to make the group "Country Musume ni Konno to Fumimoto" (Country Musume and Konno and Fujimoto). Bloodtypes: Asami - O, Satoda - A, Miunai - O.